February has been a bit of a whirlwind so far. Lots of exciting bookish events have been happening around London and some other bits and bobs have been going on in the old personal life. It's refreshing to be so busy, but I'm also pretty shattered and it's having an impact on my reading. Last weekend I had a conversation with Mike about finding the time to read, which was sparked by the anxiety I felt looking at my shelves. I have so many amazing books that I want to read and so many other books that I have planned to review either here or on Centenary News. The problem is that I have much less time to read these days. Most of my reading happens in snatched moments - ten minutes on the tube, a few distracted minutes on my lunch break or half an hour (if I'm lucky and don't fall asleep earlier) before bed - and that's not enough to make the slightest of dents in my TBR pile. My attempts to be more social and to stay active whilst I'm effectively out of action (yes, another moan about the hips, sorry), are also having a significant impact. Time spent reading is time I could be moving. Audiobooks are an obvious solution to this and I'm slowly figuring out the sorts of books I can happily listen to - any suggestions for gripping thrillers that aren't too long would be greatly appreciated! All in all I think I'm just feeling a little overwhelmed and the fact that I'm so ridiculously excited to read every book currently on my shelves is exacerbating that. Perhaps I'll talk about this more in another post. Anyway I'm not here to be a moaning minnie about all the lovely books I own, I actually wanted to pop by and talk about what's coming up next. Yesterday I finished Sam Baker's brilliant novel The Woman Who Ran (thoughts to follow shortly), so this morning I cracked on with a book that I bought probably more than a year ago: Dorothea's War by Dorothea Crewdson. This is the true diary of a VAD written in France during the First World War and it's bound to make me cry. I have a slight obsession with diaries/journals from the First World War, as you may know, particularly if they're written by nurses/hospital staff. After Dorothea's War and continuing with the WW1 theme I'm going to dive into Matthew Leonard's Poppyganda which explores the cultural history of the poppy. Aside from the fact that I love the play on words in the title, I've been really intrigued by the significance of the poppy since visiting Ypres and learning that Belgian's use a different flower as a symbol of memorial. I think once I've finished those two I'll be in need of some light relief so I've got a Margery Allingham novel lined up next. I adore Golden Age fiction and it's something I intend to read a lot more of. 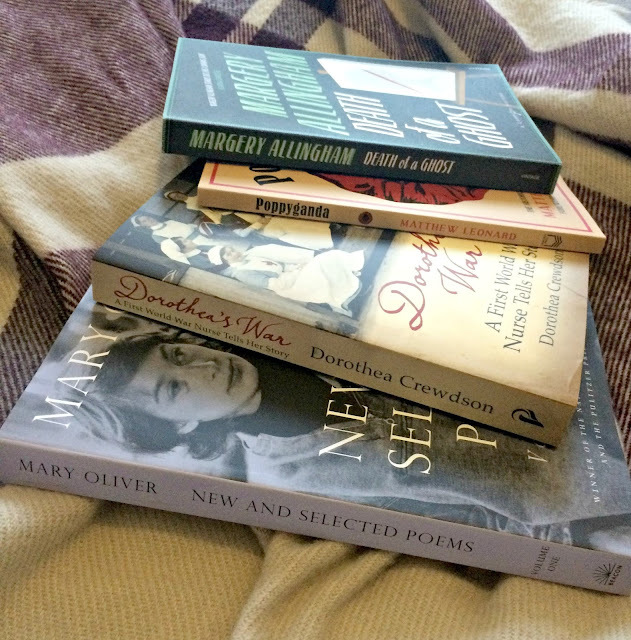 Finally, perched by my bed is a collection of Mary Oliver's poetry which I am slowly working my way through. I have Instagram to thank for introducing me to Oliver and encouraging the start of a blossoming new relationship with poetry.